Little, Brown and Company, 9780316188548, 512pp. The definitive biography of Edward Gorey, the eccentric master of macabre nonsense. From The Gashlycrumb Tinies to The Doubtful Guest, Edward Gorey's wickedly funny and deliciously sinister little books have influenced our culture in innumerable ways, from the works of Tim Burton and Neil Gaiman to Lemony Snicket. Some even call him the Grandfather of Goth. But who was this man, who lived with over twenty thousand books and six cats, who roomed with Frank O'Hara at Harvard, and was known--in the late 1940s, no less--to traipse around in full-length fur coats, clanking bracelets, and an Edwardian beard? An eccentric, a gregarious recluse, an enigmatic auteur of whimsically morbid masterpieces, yes--but who was the real Edward Gorey behind the Oscar Wildean pose? He published over a hundred books and illustrated works by Samuel Beckett, T.S. Eliot, Edward Lear, John Updike, Charles Dickens, Hilaire Belloc, Muriel Spark, Bram Stoker, Gilbert & Sullivan, and others. At the same time, he was a deeply complicated and conflicted individual, a man whose art reflected his obsessions with the disquieting and the darkly hilarious. 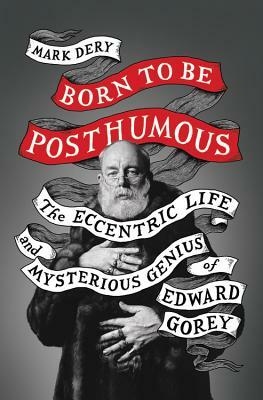 Based on newly uncovered correspondence and interviews with personalities as diverse as John Ashbery, Donald Hall, Lemony Snicket, Neil Gaiman, and Anna Sui, BORN TO BE POSTHUMOUS draws back the curtain on the eccentric genius and mysterious life of Edward Gorey. Mark Dery is a cultural critic. He coined the term "Afrofuturism," popularized the concept of "culture jamming," taught at Yale and NYU, and has published widely on pop culture, the media, and on the mythologies (and pathologies) of American life. His books include Flame Wars, a seminal anthology of writings on digital culture; Escape Velocity: Cyberculture at the end of the century, The Pyrotechnic Insanitarium: American Culture on the Brink, and the essay collection, I Must Not Think Bad Thoughts: Drive-by Essays on American Dread, American Dreams. Like Gorey, his mission in life "is to make everybody as uneasy as possible."